Md. 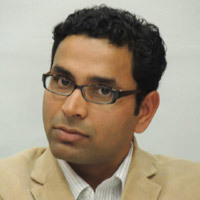 Muddassir Quamar is Associate Fellow inthe Institute for Defence Studies & Analyses, New Delhi. He holds a PhD in Middle East studies from Jawaharlal Nehru University. His doctoral thesis examined social developments in Saudi Arabia between 1991 and 2010 within a conceptual framework of Islamic modernism. Dr. Quamar’s areas of interest include Politics & Societies in the Gulf, Middle East Strategic Affairs, and Political Islam.Hisresearch papers have appeared in leading international journals such as Contemporary Arab Affairs, Digest of Middle East Studies, Journal of Arabian Studies and Journal of South Asian and Middle Eastern Studies. He has co-edited an anthology titled Contemporary Persian Gulf: Essays in Honour of GulshanDietl, Prakash C. Jain and Girijesh Pant, contributed chapters to edited volumes and regularly contributes opinion articles on strategic developments in Middle East and India-Gulf relations. Dr. Quamar has been a visiting fellow in King Faisal Center for Research and Islamic Studies, Riyadh and serves as Associate Editor of Contemporary Review of the Middle East (Sage, India). The best option would be for India to continue to work with individual members of the OIC to establish friendly relations and deepen bilateral cooperation, and work to negate the machinations of Pakistan within the OIC. Associate Fellow, IDSA, Dr. Mohd. Muddassir Quamar’s article on India-Saudi Arabia relations, titled ‘A New Trajectory in India–Saudi Relations’ was published by the All India Radio (AIR) World Service, an external services division of AIR, on March 12, 2019. Associate Fellow, IDSA, Dr Md Muddassir Quamar’s article on the maiden visit of Saudi Arabia’s Crown Prince Mohammed Bin Salman to India, titled ‘India-Saudi Arabia Ties Set for Enhancement’ was published by Air World Service, an external services division of All India Radio (AIR) on February 22, 2019. The visit signifies a new dynamism in Indo-Saudi ties, writes the author. Associate Fellow, IDSA, Dr Md Muddassir Quamar’s article on India-Saudi Arabia relations, titled ‘India and Saudi Arabia: A Growing Security and Defence Partnership’ was published by Diplomacy & Beyond, a journal of Foreign Policy and National Affairs, on February 19 2019. Associate Fellow, IDSA, Dr Md Muddassir Quamar’s article on Crown Prince Mohammed bin Salman’s forthcoming visit to India, titled ‘Saudi Crown Prince Mohammed bin Salman’s upcoming visit to India marks an upward trajectory in strategic partnership’ was published by Financial Express on February 14, 2019. Economic and social reforms have emerged as the focus area in Saudi Arabia under the leadership of King Salman and Crown Prince Mohammed bin Salman, writes the author. Associate Fellow, IDSA, Dr Mohd Muddassir Quamar’s article titled ‘US-Turkey and The Kurdish Question’ was published by the All India Radio (AIR) World Service, an External Services Division of AIR, on January 19, 2019. The article analyses US and Turkey’s collision course over the Kurds in northern Syria. In the light of Trump’s decision to withdraw US troops from Syria, Ankara has adopted a cautious approach towards the Syrian Kurds and has decided to take Moscow’s concerns into account before making any move in northern Syria. Associate Fellow, IDSA, Dr Mohd Muddassir Quamar’s article on GCC Summit, titled ‘GCC Summit Fails to Provide a Breakthrough’ was published by the All India Radio (AIR) World Service, an external services division of AIR, on December 11, 2018. The article analyses the Gulf crisis after the Qatari Emir decided to not attend the 39th Gulf Cooperation Council (GCC) Summit in Riyadh. The book traces India’s Saudi Policy and locates the current state of bilateral relations and the challenges it faces. It argues that during the Cold War the relations were largely shaped by the Pakistan factor which in turn inhibited both sides from exploring the importance and value of one another. As a result, the relations were largely transactional and marginal. The end of the Cold War coincided with two interesting developments, namely, significant growth in India’s economic power and influence and the de-hyphenation of Pakistan from its Middle East policy. This resulted in greater political engagements between India and Saudi Arabia and was strengthened by the growing energy trade ties. For long expatiate population and haj have been the backbone of the relations, and they have been new instruments as India looks to enhance its engagements with the Kingdom through investments opportunities, political contacts, shared security concerns and strategic cooperation. India’s Saudi policy, however, face many challenges most importantly the regional instability, the Iran factor, low oil price and the international dynamics. The book will be the first comprehensive work on the India-Saudi relations. Though targeting a wider audience, it will be academically grounded and based on primary sources collected from India and Saudi Arabia. Associate Fellow, IDSA, Dr Md. Muddassir Quamar’s chapter titled, ‘Saudi Foreign Policy after Arab Spring: Continuity and Change,’ has been published in KM Sajad Ibrahim edited book ‘West Asia in the Twenty First Century: Domestic and External Challenges' (pp. 111-130).